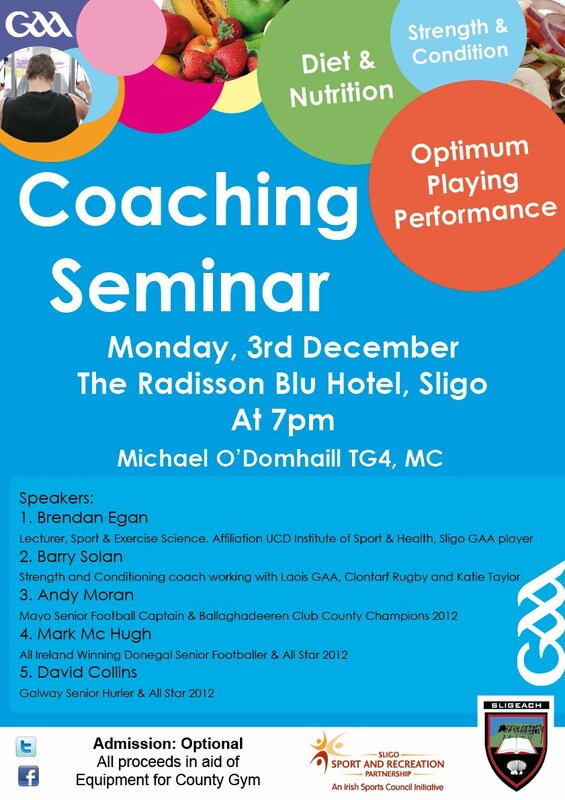 Sligo GAA are hosting a Coaching Conference on Monday 3rd December 2012 in the Radisson Blu Hotel, Sligo. Topics on the night will include, Diet 7 Nutrition, Strength & Conditioning and Optimum Playing Performance. Brendan Egan, Barry Solan, Andy Moran, Mark McHugh and David Collins will be guest speakers on the night. The Conference is set to start at 7pm. Connacht GAA is hosting its annual Play & Stay Activity Days programme in Croke Park on Thursday 12th and Friday 13th April. The Connacht GAA Activity days provide selected clubs from all over Connacht with the Croke Park experience. The players involved will get to play in Croke Park and also get a trip to the Croke Park Museum. This initiative, which was spearheaded by Connacht Games Manager, John Tobin, first took place five years ago and it has been an outstanding success. To date over 120 Hurling and Gaelic Football clubs in the province have had the opportunity to play in a series of Go Games Blitzes. These players and their mentors also get the opportunity of a tour of the Croke Park Museum. The unforgettable experience includes preparing for the games in the dressing rooms and concludes with each team lifting a cup at the presentation area in the Hogan Stand afterwards. GAA’s Coolest Cúl Camp - Roscommon leads the way. The Vhi GAA Cúl Camps provide boys and girls between the ages of 6 and 13 with an action-packed and fun-filled week of activity during the summer holidays which revolves around maximising enjoyment and sustaining participant involvement in Gaelic Games. During this summer of 2011, Roscommon GAA in association with the Roscommon Sports Partnership ran an inclusive Vhi GAA Cúl Camp specifically organised for children with disabilities. Over a period of four days 15 children participated in GAA activities and motor skills development games. GAA coaches voluntarily gave up their time to assist with the camp while numerous other volunteers helped out. With the large number of volunteers one on one coaching could be provided which was of huge benefit to the children. Brothers and sisters also attended the camp. Prior to the camp commencing it was decided that all coaches involved in the camp would be invited to attend a Coaching People with Disabilities Workshop, which was run by Coaching Ireland. Each of the coaches took away some valuable information from this course, which greatly benefited them in assisting children with a disability and ensured that they were prepared to meet the needs of all those who would be participating at this special Cúl camp. All of the coaches involved attend primary schools on a regular basis, taking children for GAA training and this particular course on Coaching People with Disabilities was of tremendous benefit in helping them gain more confidence in adapting games for children with disabilities, to ensure that everyone is included. On the 2nd August 2011, the scene was set for the first ever camp of this kind to be run in the country. According to Willie Hegarty, ‘for the following four days children, along with their brothers and sisters, enjoyed GAA skills, tunnel games, parachute games and karaoke singing to name just a few activities, while coaches gained a real sense of fulfilment knowing that they were the ones putting the smiles on all the children’s faces and making a valuable impact on their lives’. According to Jimmy O ‘Dwyre, National Cúl Camps Coordinator, "this camp in Roscommon shows the result of many people working together on a project which bought such happiness to so many children and families. I am very aware of Willie Hegarty's excellent coaching and organising work for Gaelic Games in the county and this initiative is a further example of his vision. Well done all round." It is indeed important to acknowledge the tremendous work undertaken by Willie Hegarty, GAA Games Development Officer, Roscommon Sports Inclusion Disability Officer, Annette Mc Geeney and Fiona Southwood, for their determination in implementing a initiative of this kind. This is a significant step forward for a major National Governing Body in designing GAA programmes for children with disabilities. While this programme started out as a pilot programme but from the success of the Cúl camp this summer, the GAA in Roscommon are willing to take it on board as one of their programmes in the coming years. The future looks bright in the area of inclusion in Roscommon and this is hopefully the first of many such programmes, which the GAA are striving to extend throughout the rest of the country. Yes, it is important to state that this particular Vhi GAA Cúl Camp initiative, which took place in Roscommon can be regarded as being the ‘GAA’s Coolest Cúl Camp’ in 2011. 8.15pm Speaker: David Matthews, (Ex Irish International Athlete, current Physical Trainer with the Cork Senior Hurling team). Closing date for application is Friday 3rd February 2012. Connacht GAA are hosting Activity Days in Croke Park on Thursday 28 and Friday 29th April. The Connacht GAA Activity days provide selected clubs from all over Connacht the experience of Croke park. The players involved will get to play in Croke park and a trip to the Croke park Museum. This initiative, which was spearheaded by Connacht Games Manager, John tobin, first took place four years ago has been an outstanding success and so far over the four years 90 clubs in the province have had the Croke park experience. In the next two days 30 clubs from all over Connacht will take the field of Croke Park in mini blitzes played out over the two days. On Thursday 13 U12 Hurling teams from Galway will play off in a Go Games blitz played off over the day. On the Friday 17 U12 Football clubs from the five Connacht counties will play in their Go Games Blitz. Over the two days all clubs will also get the opportunity of a Croke park Museum tour. Connacht GAA would like to thank the County Coaching Committees, the Games managers and the coaching staff and the various clubs for their cooperation to date. To all players participating over the next two days, we hope that they enjoy their experience and that i will leave them with longlasting happy memories. • The Connacht Coach Education Committee held eight meetings during 2010. • This Committee comprises of eight Tutor Trainers representing all counties in Connacht, together with the Provincial Games manager. • Members have attended the Connacht Coaching Forum and National Coaching Conference in Croke Park. • A Connacht Review of all our Coaching Courses has taken place and recommendations were acted on. • Members have attended National Tutor workshop. • In conjunction with the Connacht Coaching and Games Committee, the Connacht Coach Education Committee are working on meeting the targets as set down by the Connacht GAA Strategic Vision and action Plan 2009 -2015. • In 2010, 22 new Tutors completed their training and graduated. also include 6 Handball Tutors. • A two evening Tutor up-skilling workshop was recently provided for all Connacht Tutors on ‘Psychological Aspects’ with Paul O Connor DCU. • Each County in Connacht have set up a Coach Education Committee. • We have four new tutors currently training as Tutor Trainers. • We have provided additional training to all our Tutors on Disability Awareness. • We have tutors trained for each county as Child Protection and Welfare Tutors. • All new Tutors were observed by Coach Education Committee members prior to their graduation. We are currently developing a Connacht Tutor Mentoring system. • There have currently 45 Connacht Tutors. In addition we have also trained 7 GAA Tutors from Britain and 4 GAA tutors for the North American Board. We also have provided training to 6 Handball Ireland Tutors. • The following number of tutors have been trained in their respective counties: Galway 19, Leitrim 5, Mayo 8, Roscommon 6 and Sligo 7. · To date 61 Foundation Courses have been delivered in 2010 and 33 already in 2011. · Connacht has Piloted the Award 1 Youth Football Course in association with Munster GAA. · Two Award 1 Child Courses have been delivered in 2010 and 3 to date in 2011. · Connacht has Piloted the Award 2 Youth Course in Castlebar. · All our Tutors are Garda Vetted. All participants on Connacht Coach Education Programmes are either Garda Vetted or in the process. · Three meetings regarding Quality Assurance have taken place with Catherine Bird, Coaching Ireland and Peter Horgan, Education Officer, Croke Park. · Connacht GAA Council has a dedicated person for Quality Assurance. The Sean Purcell Academy Day takes place on Saturday August 20th. in Tuam. Tuam Stadium and the Tuam Stars grounds are the venues that will host the competition . In all,12 County under 14 teams will participate in the programme. Each team will play a minimum of 3 games over the course of the day . Many of the stars of the future will display their skills and it is hoped that a large attendance will travel to witness the event. Andy Moran will conduct a Fundamental Workshop to demonstrate his New Fundamental Pack. The pack complements our own Fun Do and promotes many new ways to develop the Basic Fundamental Skills. The Course will take place in St Nathys College, Ballaghaderreen on Saturday 29th January from 9.00am to 1.00pm. All Coaches are invited to attend. A Coaching Workshop will take place on Friday 28th January 2011 at 7.30pm in the Mercy Secondary School Gym, Claremorris. The new TRX Training System will be demonstrated. This is a simple suspension system that is designed to maintain and develop strength while simultaneously conditioning the core. I think it may be of real practical value to all GAA teams. Over the past number of years the Connacht Council Coach Education committee in conjunction with the 5 Counties have been providing coaching courses for all counties. Several thousand people have undertaken Foundation level and level one. It is the policy of the G.A.A. that all coaches, dealing with our players, must have the appropriate qualification. Each of our courses are age specific so that the coach will acquire a better understanding of the coaching needs of that particular group. In order to identify the number of qualified coaches in our clubs the National Coaching Committee have set up a website that will register all coaches when they are inputted to the system. This is the function of the club secretary or the Coaching Officer. When completed this will provide us, and you, with invaluable information. The site has been sent to all Secretaries and Club coaching officers. Inputting the information is easy and painless. The good news is that the National Coaching & Games Committee will have a free draw worth several thousand euro worth of equipment for all clubs that complete the audit. If you require any assistance contact your County Games Manager or the Provincial office.